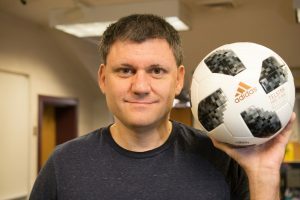 Over the past several weeks, University of Lynchburg physics professor Dr. John Eric Goff has been the go-to guy for reporters all over the world when it comes to the physics behind the Telstar 18 ball that’s being used at the 2018 FIFA World Cup soccer tournament in Russia. Dr. Goff, author of Gold Medal Physics: The Science of Sports, analyzed the aerodynamics of the Telstar 18 and found that the ball soars about 8 or 9 percent less distance than the Brazuca ball used in the 2014 World Cup. “There will be a slight reduction in the long range kicks, and that’s probably going to be noticed by the goalkeepers, who are really trying to hit the ball down the pitch at a great distance,” Dr. Goff explained in a recent “Playing with Science” episode. Dr. Goff is a frequent guest on “Playing with Science,” a podcast that’s part of astrophysicist Neil deGrasse Tyson’s StarTalk network. Domestically, Dr. Goff also has been interviewed recently by National Public Radio, the American Physical Society, Tech Insider, Popular Science, WIRED, Accuweather, the Last Word on Soccer podcast, and other outlets. You can read more about what Dr. Goff has been up to, including his predictions about the 2018 Tour de France, on his blog and Facebook page.